A series of free, online High School Geometry Video Lessons and solutions. Videos, worksheets, and activities to help Geometry students. 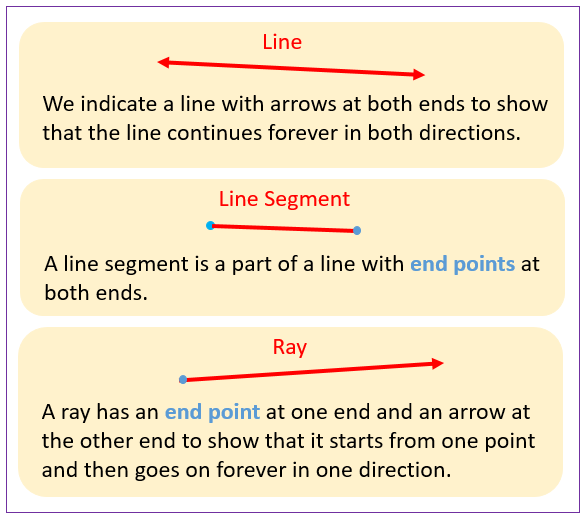 The following diagrams show the differences between a line, a line segment and a ray. Scroll down the page for more examples and solutions of lines, line segments and rays. Conjectures are statements that use an if, then structure and are commonly presented throughout Geometry (for example, if a triangle has two congruent base angles, then that triangle is isosceles). The math converse of a statement switches the if and then, resulting in a statement that may or may not be true; verifying the truth value of a converse is a common exercise in Geometry. How to find the converse of a conditional statement and determine if it is true? A line segment is part of a line, has fixed endpoints, and contains all of the points between the two endpoints. One of the most common building blocks of Geometry, line segments form the sides of polygons and appear in countless ways. Therefore, it is crucial to understand how to define and correctly label line segments. How to define and label a line segment? A ray is part of a line, has one fixed endpoint, and extends infinitely along the line from the endpoint. Opposite math rays are rays with a common endpoint, extending in opposite directions and forming a line. How to identify, define, and label rays and opposite rays? Parallel lines are two lines in the same plane that never intersect. In a coordinate plane, parallel lines can be identified as having equivalent slopes. Parallel lines are traditionally marked in diagrams using a corresponding number of chevrons. Skew lines are two lines not in the same plane that do not intersect. Parallel and skew lines are also important concepts in Algebra and upper-level math courses. How to mark parallel lines, how to show lines are parallel, and how to compare skew and parallel lines?